The secret ingredient here is saba, an Italian-style syrup made from wine-grape juice cooked down to a concentrate. 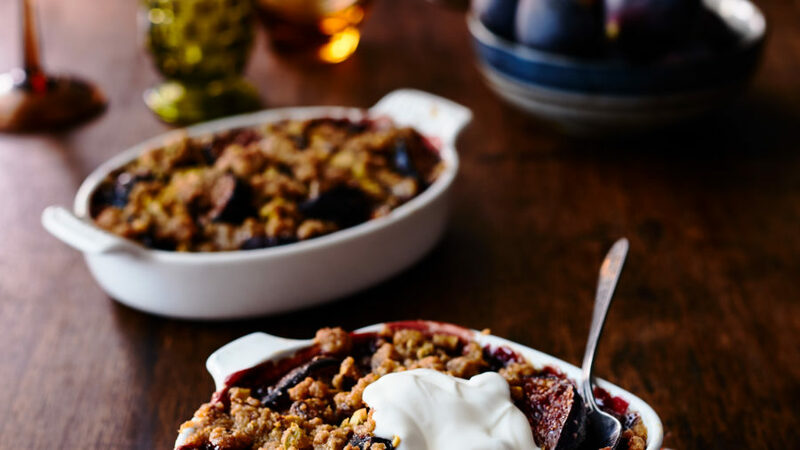 It underscores and lifts the flavor of figs. So do lemon zest and a spoonful of crème fraîche. As for the figs, our favorite is Black Mission, a purple-black, richly flavored variety. To bake the recipe in one big dish rather than several small ones, see the instructions below. Preheat oven to 350°. Make filling: In a large bowl, combine granulated sugar, tapioca, and cornstarch. Stir in remaining ingredients except for figs. Gently stir in figs and let stand 15 to 20 minutes, stirring occasionally, for tapioca to begin to soften. Transfer to 4 to 8 shallow 1- to 1 3/4-cup gratin dishes and set on 2 rimmed baking sheets; or use 1 big dish*. Meanwhile, make streusel: In a large bowl, combine flour, brown sugar, and salt. Stir in vanilla, lemon zest, and pistachios. With your fingers, squeeze and rub butter into flour mixture until butter is completely blended and coarse lumps form. Scatter streusel over filling. Bake until filling is bubbling and streusel is deep golden brown in center, 30 minutes. Let cool on a rack at least 25 minutes. * Find saba at gourmet food stores and supermarketitaly.com. For a big crisp, use a shallow 2- to 2 1/2 qt. baking dish about 1 1/2 in. deep. Bake directly on oven rack (not on a baking sheet) 35 to 40 minutes.